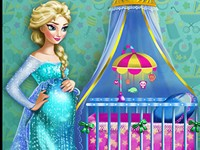 Elsa is pregnant and she needs your amazing designer skills to decorate the babys room. Choose from different furniture elements and make the room cute and childish, but in an elegant and royal way. Match everything together and you will have the perfect environment for Elsas baby!